The planing form can be used as a 60° block or anvil. 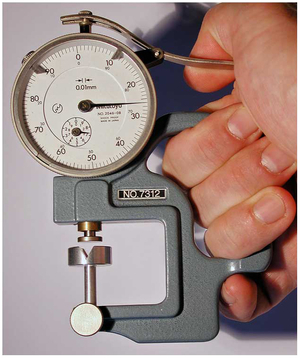 The depth at each station is known and the height of the strip above the form can easily be measured by a dial height gage. For users of flat-soled planes, simply slide the strip one station to the left (for right handers) and read the height above the form. Add that height to the depth of the station for the thickness of the strip. There may be a slight loss in accuracy here due to both depth-of-form and height-above-form measurements being necessary, but the results are still acceptable. For those using a grooved plane, knowing the height (which is consistent throughout its length) of the finished strip above the form makes it even easier, simpler, and quicker since it is never necessary to slide the strip or lift it from the form. (See A Gage For Grooves, in The Planing Form issue # 58) In both cases the height gage, along with a set of rods, remains the best way to set planing forms.